Dry weather is likely to persist over TN for the next couple of days. The situation might change over extreme south TN towards the weekend , isolated rains could wet a few places. The weather over the rest of the state would not undergo any significant change. 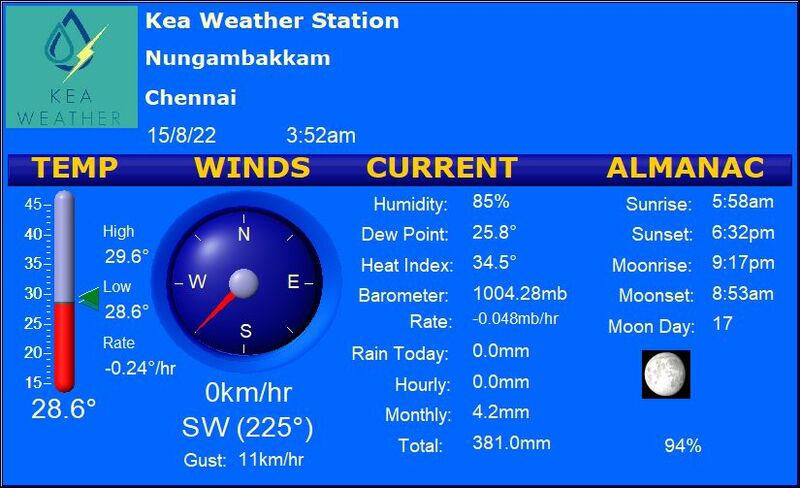 Chennai – Clear skies with a maximum of 32 C and minimum of 22C. Madurai – A rather hot afternoon at 36C C followed by a cooler night with min of 20C. Trichy – Warm afternoon with maximum at 34C.Night will be pleasant with 21C. Coimbatore – Partly sunny hot day with a maximum of 34 C. Night will be cooler with 19C. Vellore – A warm afternoon likely to be followed by a cool night with maximum and minimum temperatures of 34 C and 18 C respectively.